The Dead Sea’s rich mineral salts deeply cleanse and tone while restoring the skin’s natural pH. This unique soap combines pure Dead Sea salt, goat's milk, argan oil, shea butter and essential oils in a natural vegetable base. Triple milled* right at the source — The Dead Sea. Absolutely nothing artificial. Pure white moisturizing soaps scented with soothing lavender essential oil. 6 pack of shrink wrapped soaps with tear-off top for display or easy storage. *Triple milling creates a higher quality, longer lasting bar. The Dead Sea’s rich mineral salts deeply cleanse and tone while restoring the skin’s natural pH. This unique soap combines pure Dead Sea salt, argan oil, shea butter and essential oils in a natural vegetable base. Triple milled* right at the source — The Dead Sea. Absolutely nothing artificial. Scented with the sweet nectar of lemons and lemon verbena plant. 6 pack of shrink wrapped soaps with tear-off top for display or easy storage. *Triple milling creates a higher quality, longer lasting bar. The Dead Sea’s rich mineral salts deeply cleanse and tone while restoring the skin’s natural pH. This unique soap combines pure Dead Sea salt, argan oil, shea butter and essential oils in a natural vegetable base. Triple milled* right at the source — The Dead Sea. Absolutely nothing artificial. Scented with the sweet nectar of oranges. 6 pack of shrink wrapped soaps with tear-off top for display or easy storage. *Triple milling creates a higher quality, longer lasting bar. The Dead Sea’s rich mineral salts deeply cleanse and tone while restoring the skin’s natural pH. 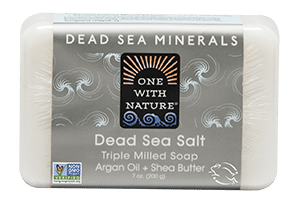 This unique soap combines pure Dead Sea salt, argan oil, shea butter and essential oils in a natural vegetable base. Triple milled* right at the source — The Dead Sea. Absolutely nothing artificial. Scented with the irresistible scent of blueberries, blackberries and raspberries. 6 pack of shrink wrapped soaps with tear-off top for display or easy storage. *Triple milling creates a higher quality, longer lasting bar. Why Dead Sea Mineral Salt? Most bath salts are primarily sodium chloride. Dead Sea Salts are a unique compound containing 21 different skin nourishing minerals such as: calcium, iodine, potassium, magnesium, zinc and bromide. This 100% Pure Dead Sea mineral salt improves the appearance of skin by balancing and maintaining moisture levels. Scented with soothing eucalyptus. Why Dead Sea Mineral Salt? Most bath salts are primarily sodium chloride. Dead Sea Salts are a unique compound containing 21 different skin nourishing minerals such as: calcium, iodine, potassium, magnesium, zinc and bromide. This 100% Pure Dead Sea mineral salt improves the appearance of skin by balancing and maintaining moisture levels. Perfectly Fragrance free. Why Dead Sea Mineral Salt? Most bath salts are primarily sodium chloride. Dead Sea Salts are a unique compound containing 21 different skin nourishing minerals such as: calcium, iodine, potassium, magnesium, zinc and bromide. This 100% Pure Dead Sea mineral salt improves the appearance of skin by balancing and maintaining moisture levels. Scented with calming lavender essential oil and natural botanicals. Why Dead Sea Mineral Salt? Most bath salts are primarily sodium chloride. Dead Sea Salts are a unique compound containing 21 different skin nourishing minerals such as: calcium, iodine, potassium, magnesium, zinc and bromide. This 100% Pure Dead Sea mineral salt improves the appearance of skin by balancing and maintaining moisture levels. Scented with natural rose fragrance and botanicals. The Dead Sea’s rich mineral salts deeply cleanse and tone. 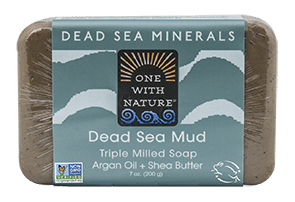 This unique soap combines pure Dead Sea salt, argan oil and shea butter in a natural vegetable base. Triple milled* right at the source — The Dead Sea. Absolutely nothing artificial. Scented with a natural botanical extract blend. *Triple milling creates a higher quality, longer lasting bar. VOLCANIC ASH is truly Mother Nature's natural skin purifier. Rich in minerals, its exfoliating properties mean that it is ideal for removing the dead outer layers of skin. The strong absorption of sebum and cooling effect refreshes the skin and contracts pores. It is also EXCELLENT for oily skin. The Dead Sea’s rich mineral salts deeply cleanse and tone. 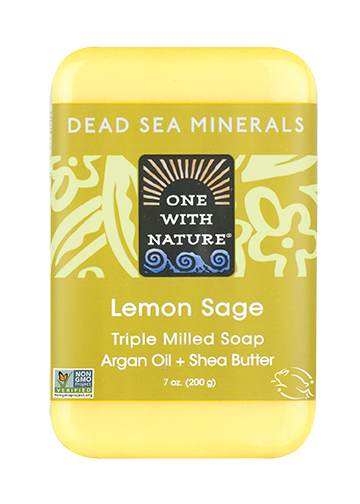 This unique soap combines pure Dead Sea salt, argan oil and shea butter in a natural vegetable base. Triple milled* right at the source — The Dead Sea. Absolutely nothing artificial. Scented with a natural botanical extract blend. *Triple milling creates a higher quality, longer lasting bar.